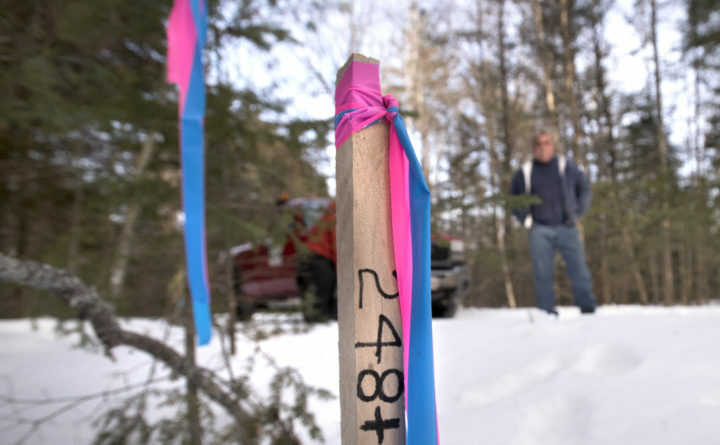 Stephan Lee stands behind a survey stake on land his family owns in Holden. The stake marks a point in relation to the proposed route of the I-395 extension that would cut through portions of Brewer, Holden and Eddington. The six-mile stretch of road that would extend Interstate 395 to Route 9 has been subject to years of debate, but the latest attempt to re-evaluate the project’s necessity — and delay it in the process — has failed. The Legislature’s transportation committee this week unanimously opposed a bill that would have required the Maine Department of Transportation to halt all work on the project temporarily while a private company hired by the state would conduct a new analysis of the project and recommend whether the state should continue the project that would extend I-395 through parts of Brewer, Holden and Eddington. Sen. Kimberley Rosen, R-Bucksport, proposed the bill after she heard from constituents in Brewer who opposed the proposed route of the highway connector. Rosen said last month that she had initially supported the project that would extend I-395 from the Brewer-Holden town line to Route 9 in Eddington, but decided the project needed an outside look after she heard about her constituents’ concerns. “Many local residents contend that throughout this long regulatory process the [Maine Department of Transportation] has not been straightforward with compelling arguments to justify the costs and the benefits of moving ahead,” Rosen said in her testimony to the committee during a March 14 public hearing on her bill, LD 783. Deputy Transportation Commissioner Nina Fisher said a $25 million federal grant paying for much of the project has a deadline attached for the state to commit the funds to the project, and the department is currently on schedule to meet it. The delay Rosen’s bill proposed, she said, would have jeopardized that schedule and the grant. Brewer residents Larry Adams and Lisa Sturgeon, who have been vocal about their support for Rosen’s bill, also testified at the hearing, saying that the highway’s construction would hurt their neighborhoods. They also both questioned the need for the project, and said they hope the Department of Transportation ultimately chooses an alternate route for the project. The Department of Transportation has been moving ahead with the project as the debate continues. On the same day as the transportation committee hearing last Thursday, the Department of Transportation issued a public notice informing two homeowners in Holden that the state planned to acquire their properties for the highway’s construction. One of the homes belongs to David Lakeman Sr. of Lakeman and Sons, a scrap metal business in Holden. Stephan Lee, who is related to Lakeman and manages his business, said last month that Rosen’s bill represented his last hope to save his land.